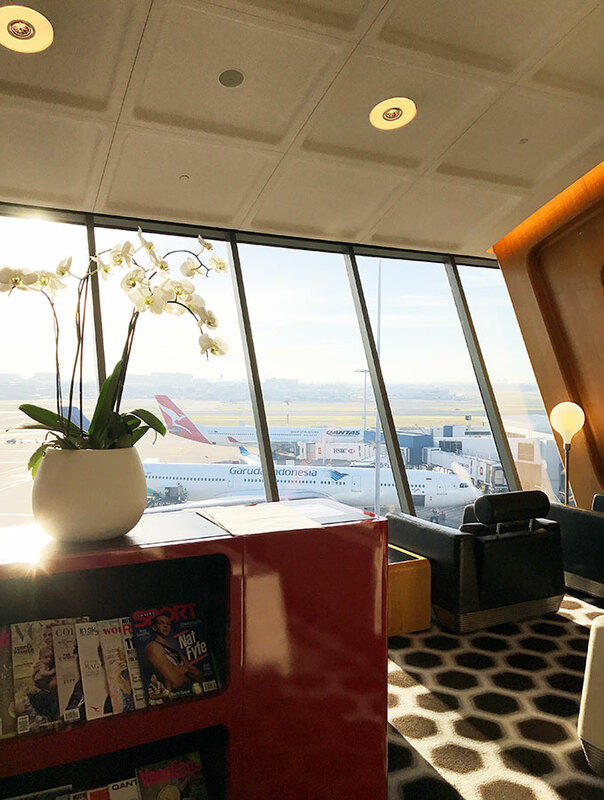 The Qantas first class lounge Sydney has held its own over the years and is still the best airline lounge at Sydney International Airport. 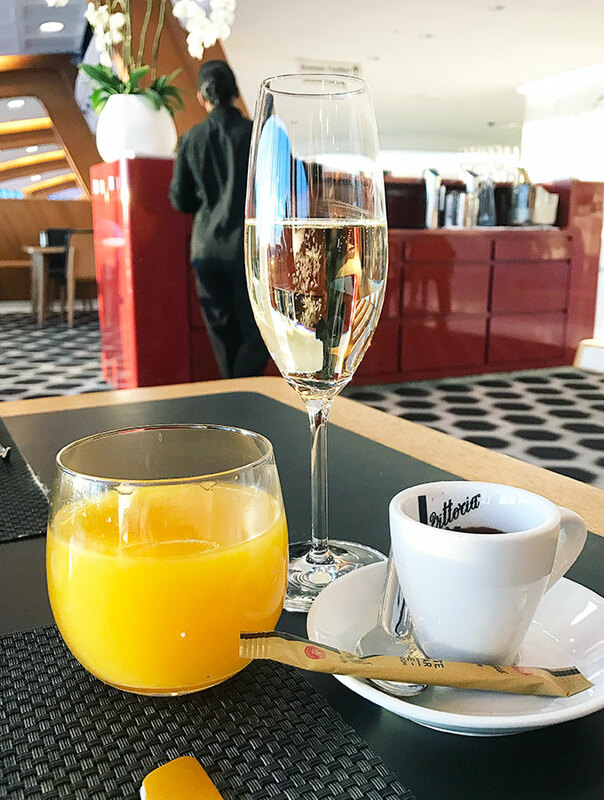 Most of us don’t get the opportunity to visit airport airline lounges. 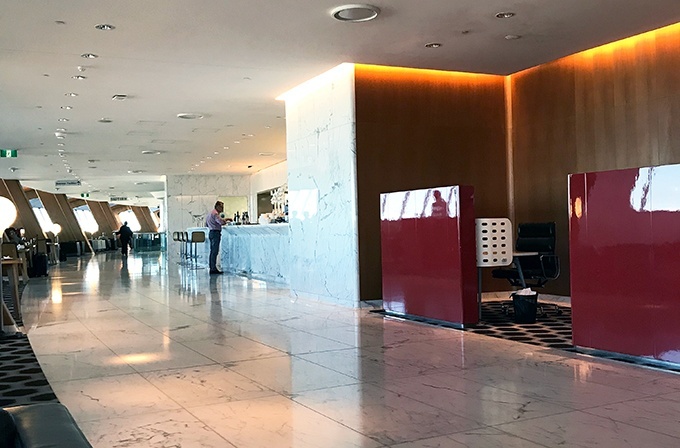 If you are lucky enough to gain preflight access to the Qantas lounge in Sydney, it will most likely be the business class lounge. Curious how the top of the food chain frequent flyers and first class passengers spend their airport time? While you drink overpriced coffee in the crowded fast food airport dining area, or try to find a comfy spot for that three hour delay. 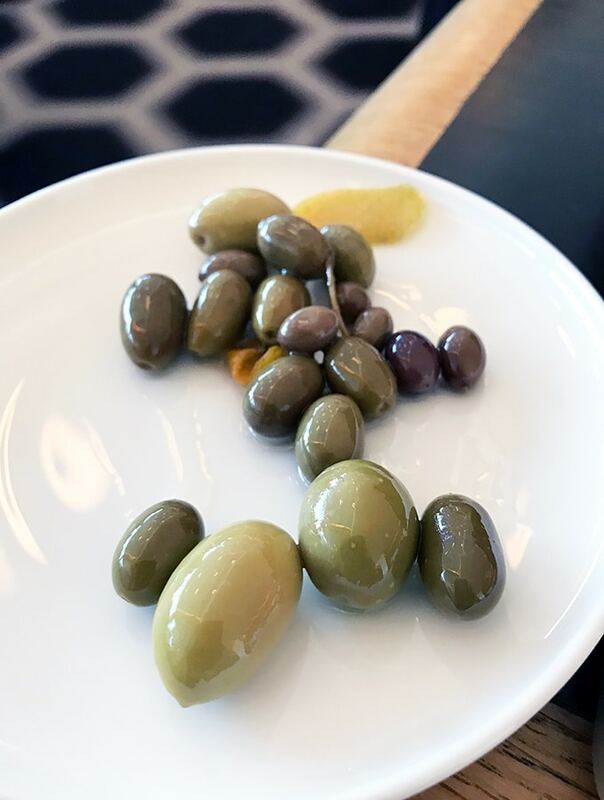 Even though the Qantas first class lounge Sydney is now over 10 years old, it is still my favourite airline lounge. I have had the privilege of sticking my nose in quite a few over the years, but this still remains my favourite. The lounge is very easy to locate. Once you are through immigration and security, it’s then simple (or not so simple) case of weaving your way through duty free to a set of escalators. There is a big red sign in front of them confirming you are heading in the right direction. 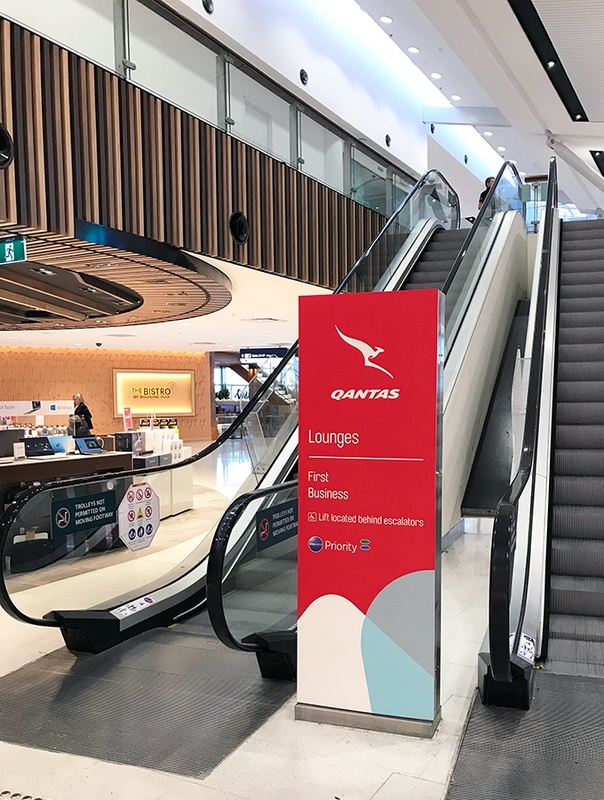 The Qantas first class lounge is directly at the top of the escalators. 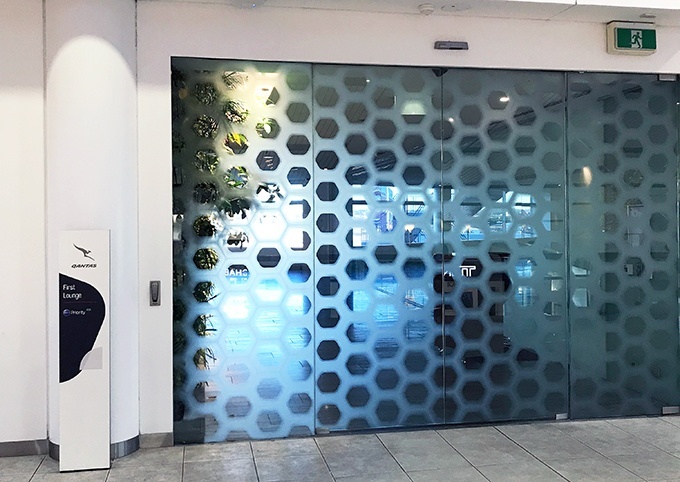 Enter through the sliding doors and you will be greeted by a staff member. They will check your boarding pass, and if your ducks are aligned access will be granted. Level three is only the entrance. 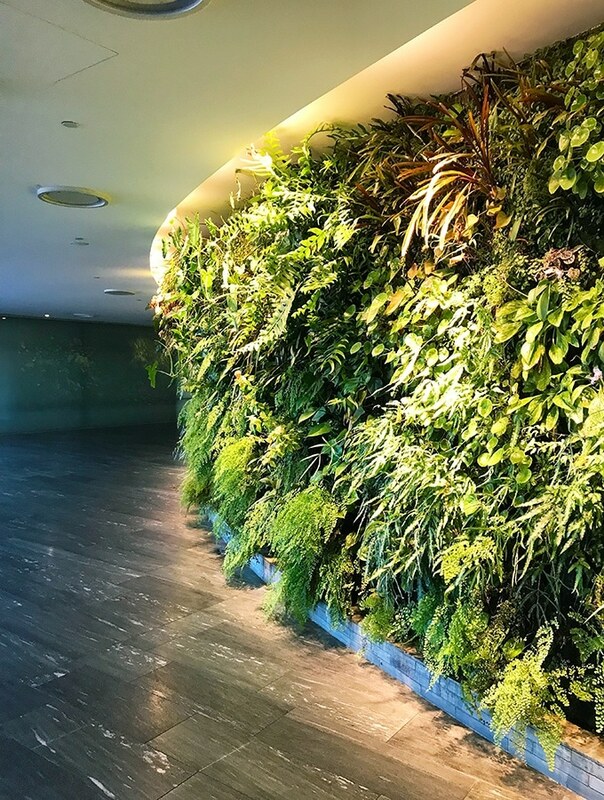 You will need to make your way around to another escalator via a long and impressive vertical garden wall. A green and luscious living wall comprising of over 8,000 plants. 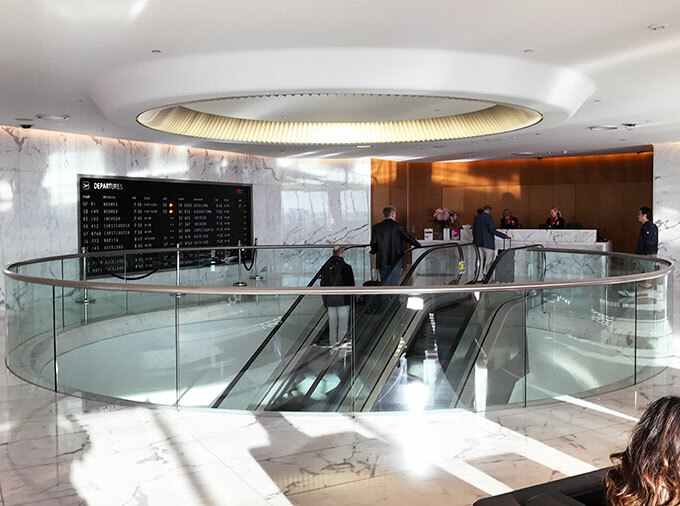 Once up these escalators (or lift if needed) is my favourite feature of the lounge. A large old school flip over departures board. When departure information is updated you are alerted by the sounds of flip flip flip flip flip flip flip. I adore it! 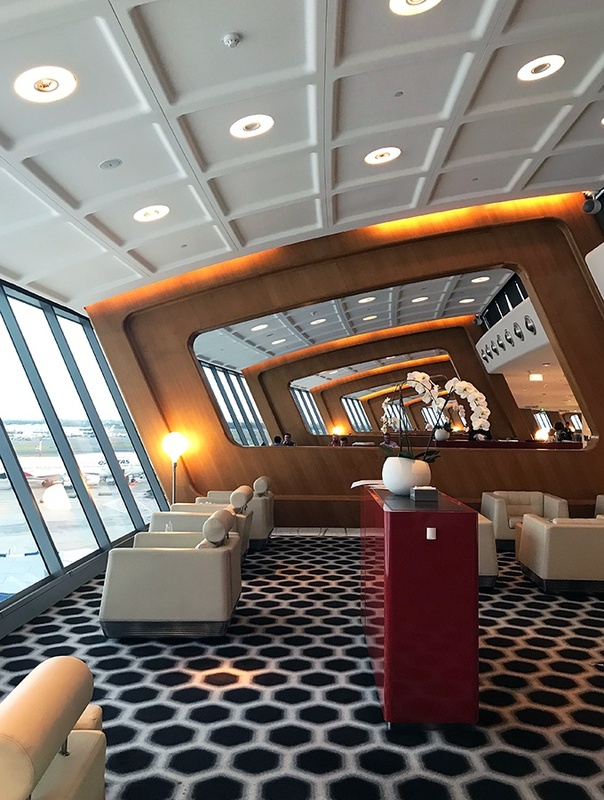 There is one final boarding pass check before you are allowed to enter the Marc Newson designed Qantas first class lounge Sydney. 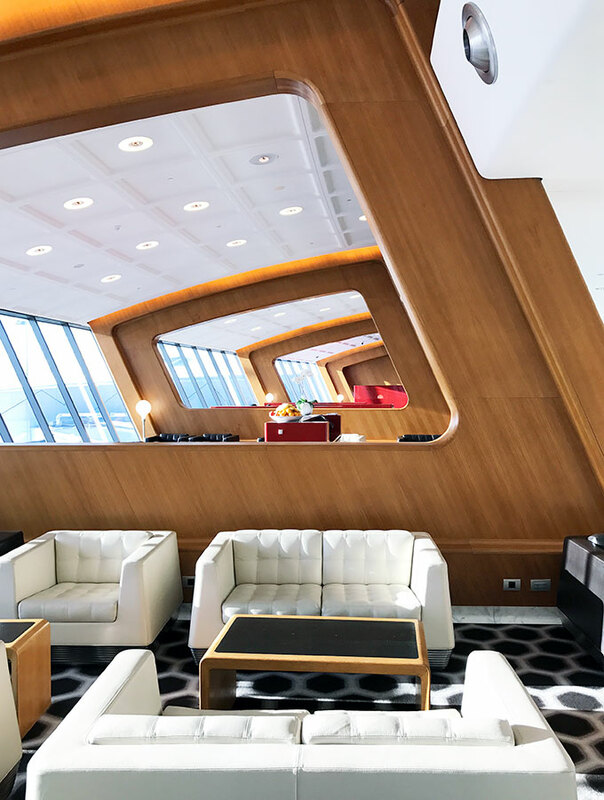 The lounge was designed to bring back some of the style and glamour of the early years of aviation. In following this concept, the result is a modern and minimalistic lounge. Full of natural subdued warm tones that are enhanced by splashes of Qantas red. 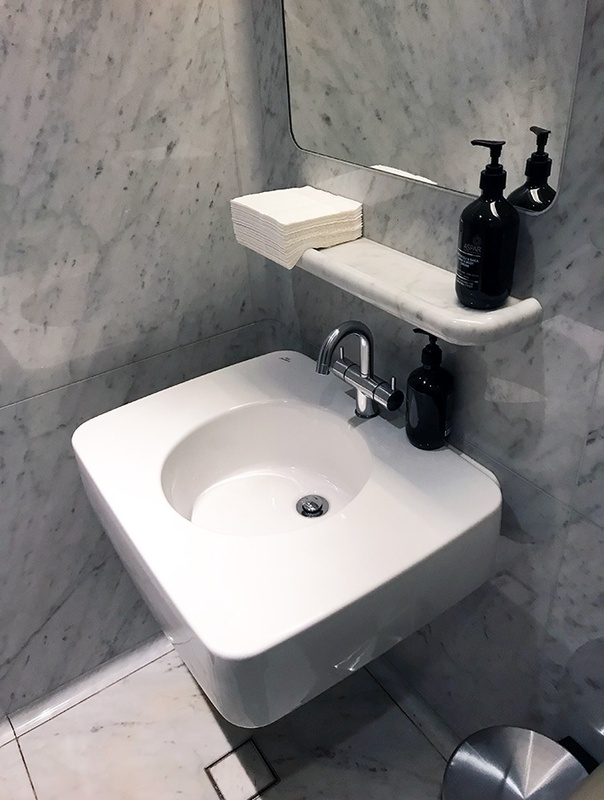 Carrera marble has been used for the walls and the floor. 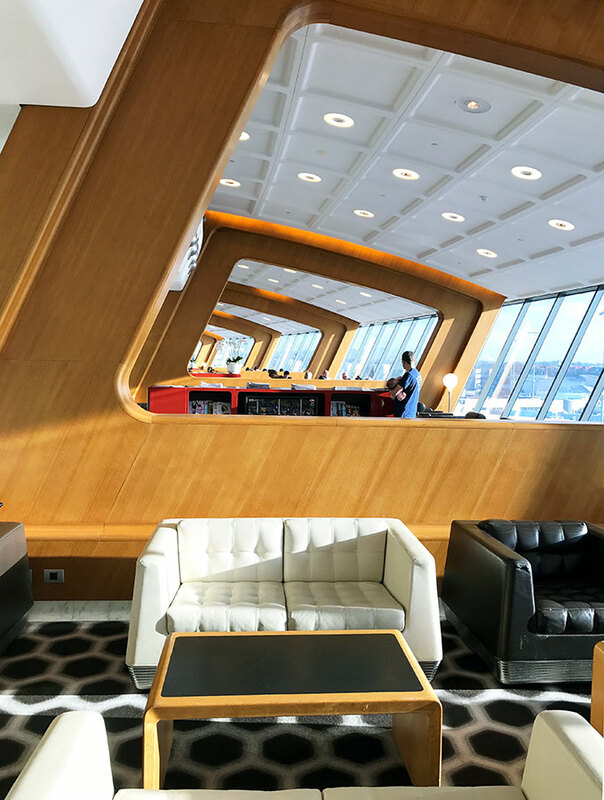 The lounge is a large elongated space, running directly over the top of the thrid floor business class lounge. Even though the lounge is large it still feels intimate. Marc has used large curved wooden dividers made of European oak throughout the lounge. Sectioning the large space, but also allowing it to feel light and airy. 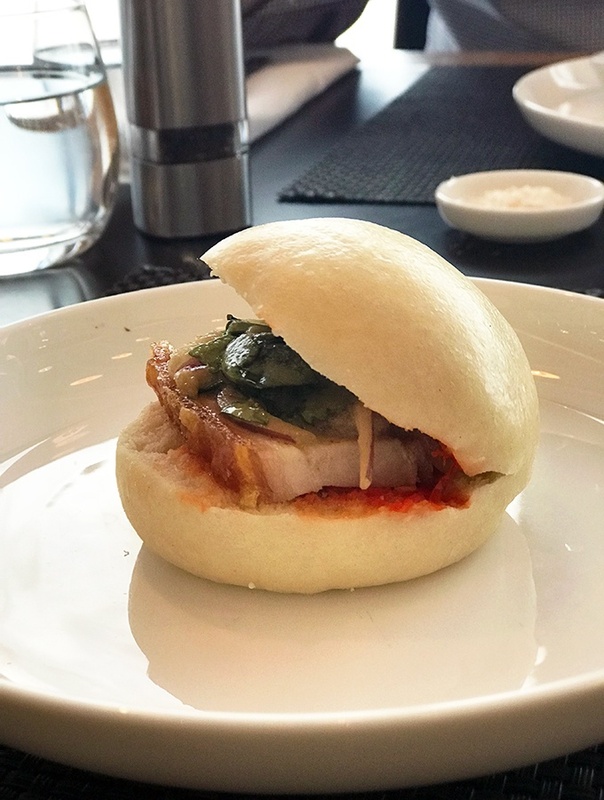 The dining offering in the Qantas first class lounge Sydney is truly exceptional. 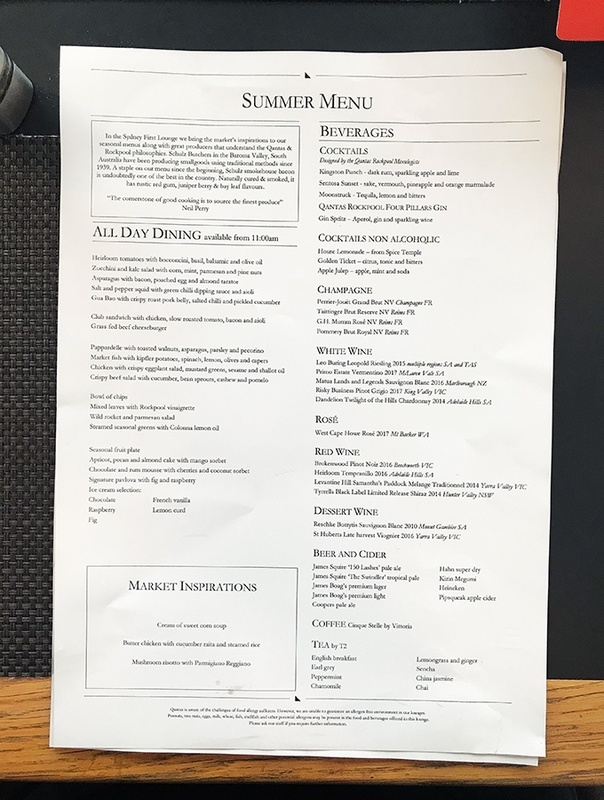 The menu has been designed by Neil Perry. I will be honest that doesn’t impress me all that much. It’s not like Neil is whipping up my breakfast or lunch in the lounge kitchen. But the chefs hitting the pots and pans are doing a stellar job. 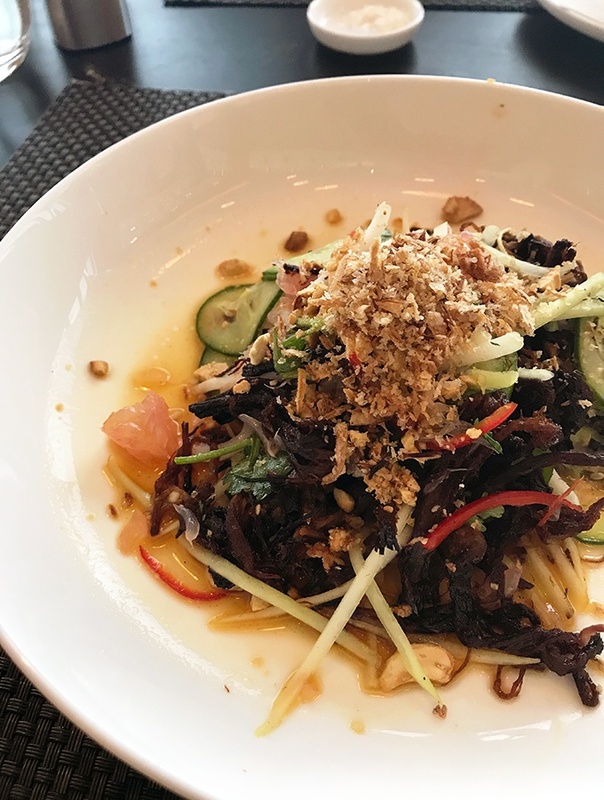 The menu changes seasonally and I have shared some dishes from the more recent Summer, Spring and Autumn menus. 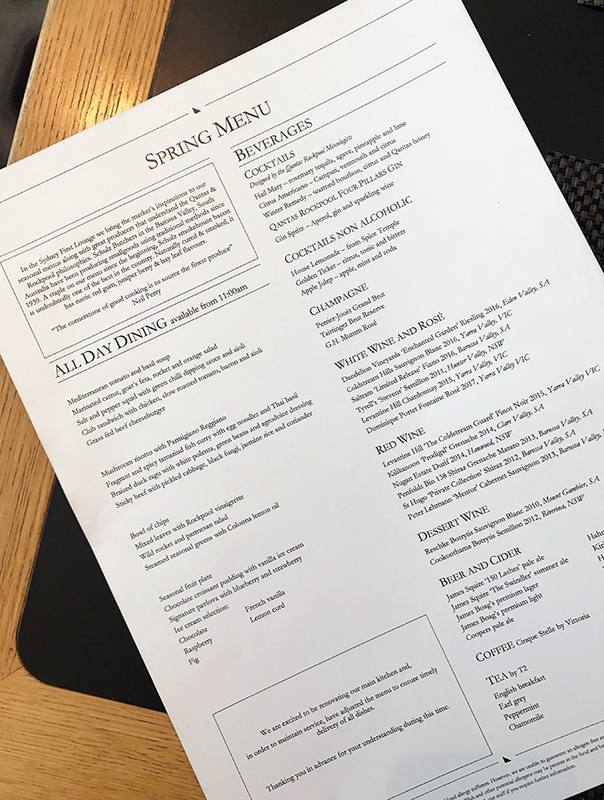 Even though the menu does change there are three dishes that are not negotiable and are permanent fixtures, the Grass fed beef cheeseburger, the club sandwich and salt & pepper squid. 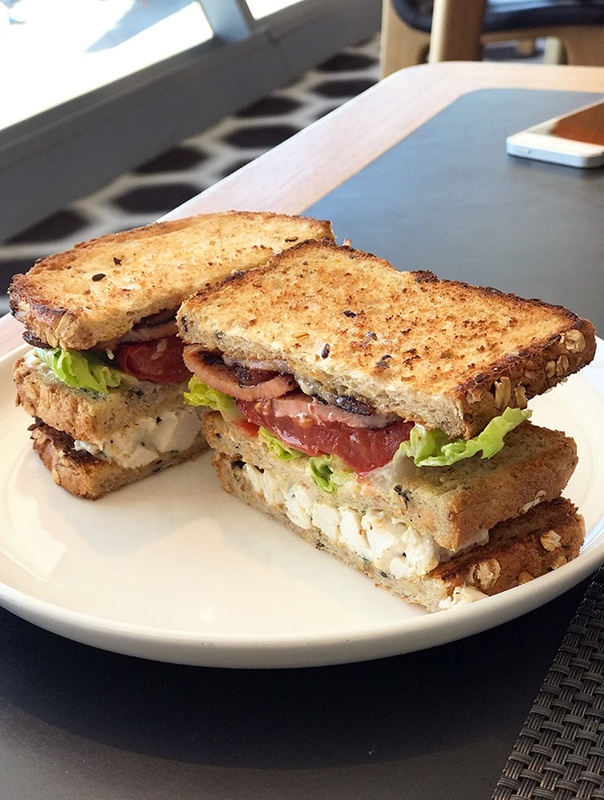 The club sandwich is a delicious twist on a BLT. One layer is juicy chicken breast and the other is bacon, lettuce and slow roasted tomatoes. 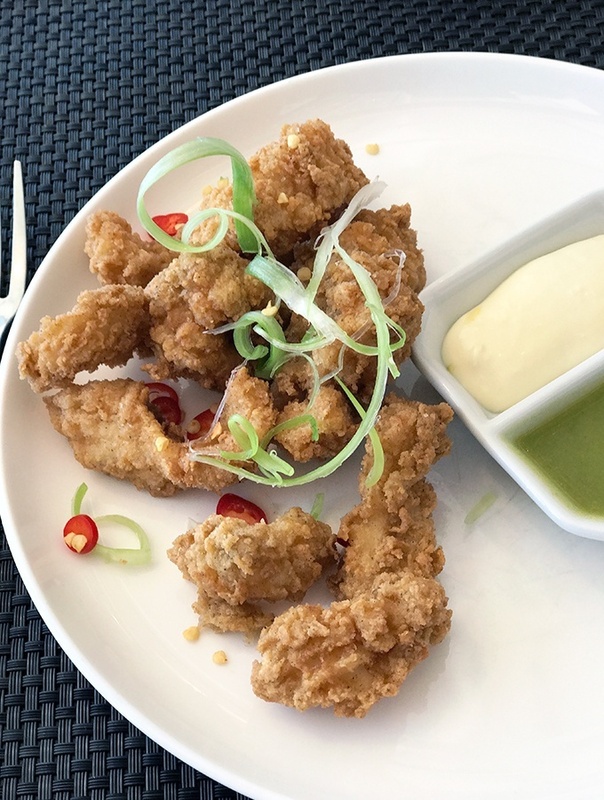 The salt and pepper squid is always crispy and served with green chili dipping sauce and aioli. The third mainstay, the cheeseburger (not pictured), I’m not a fan. I don’t find anything special about it. It’s an okay burger, but I think it stays on the menu just because it is a burger. 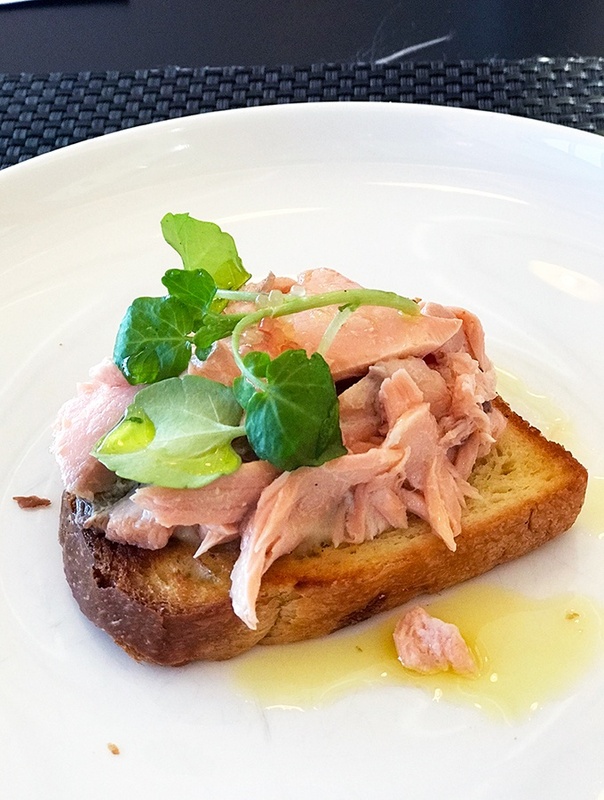 On my last visit to the lounge, I ordered the poached salmon on toasted brioche. The salmon was gorgeously moist and went beautifully with the sweet toasted brioche. 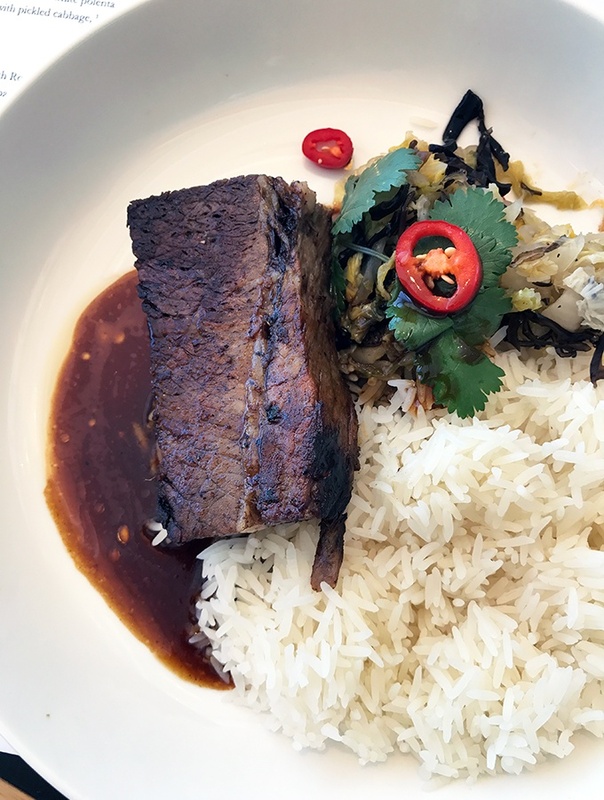 The beef brisket was tender and rich, and I was glad for the salad on the side I ordered (not pictured). They do great fries, giving you the heads up on that. 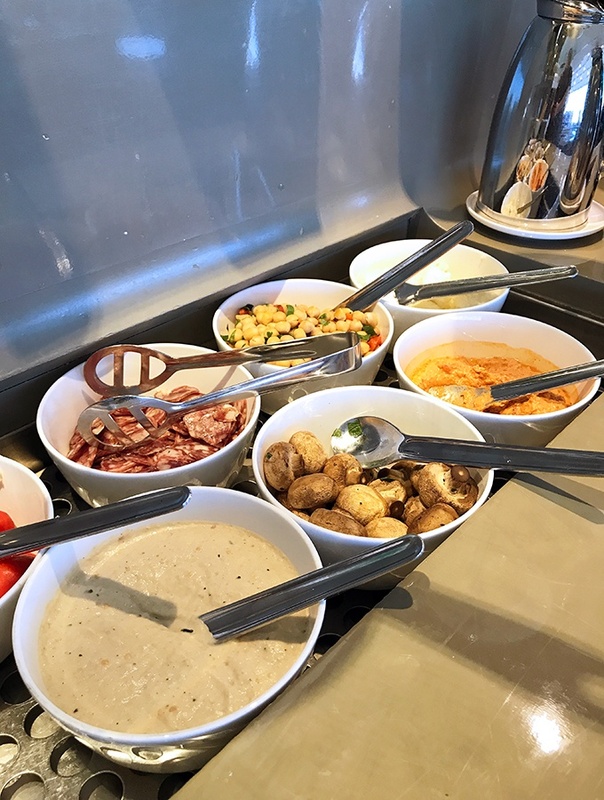 There is a separate breakfast menu that is available until 11.00am. Please note that champagne is available no matter your dining time, and when in Rome, go the bubbles. The yolks of the poached eggs are nice and runny nine times out of ten. 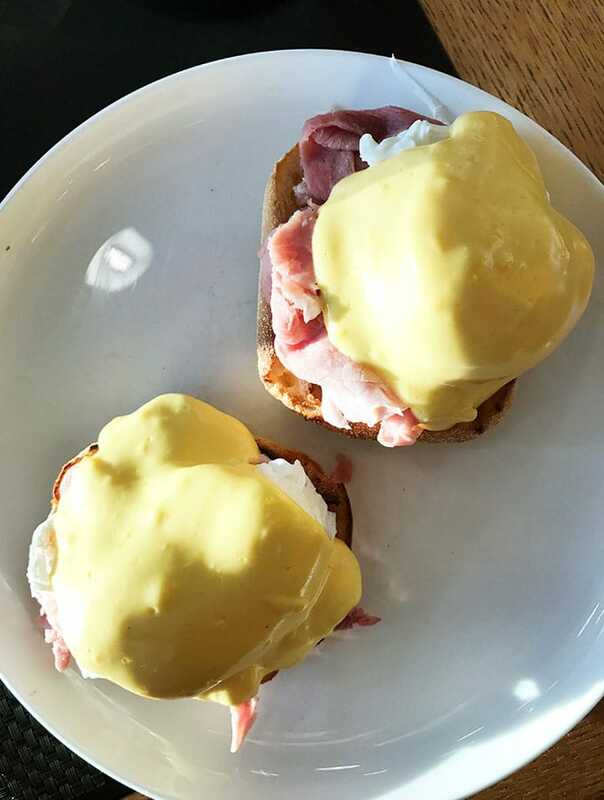 The eggs Benedict is a good go to. There was a sago porridge with palm sugar and finger lime on the menu at one time. I still have very fond memories of it. If you don’t feel like a sit down meal (you crazy person), there is a self serve option. It isn’t overly impressive but it does give guests the opportunity to grab something. 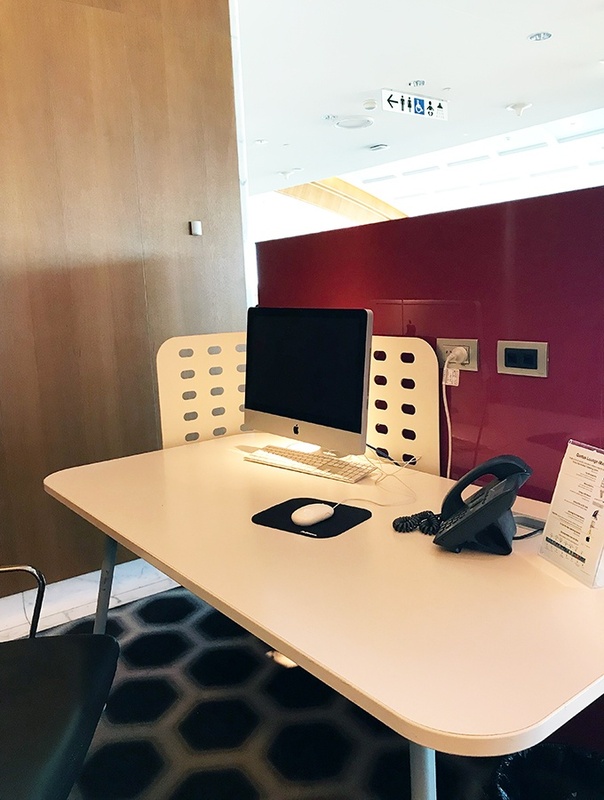 There is a business centre in the Qantas first class lounge Sydney. A handful of iMacs are there for guests use. I do appreciate the step by step instructions as well. If you are like me and travel with a laptop, then free Wi-Fi available. For those that don’t feel like working there is a full on spa, which I am yet to enjoy. I have been unlucky so far. With my flights leaving early morning or evening, the spa hasn’t been open. The spa is open 8am to 4pm daily. What I can tell you is that there is another vertical garden in the treatment room. Treatments run for 20 minutes and are a lovely way to indulge. You can choose from massages, foot and hand treatments right through to facials. When you need to go to the loo, aka bathroom/toilet, it is an individual affair. More marble and your own space to do what you need to do. 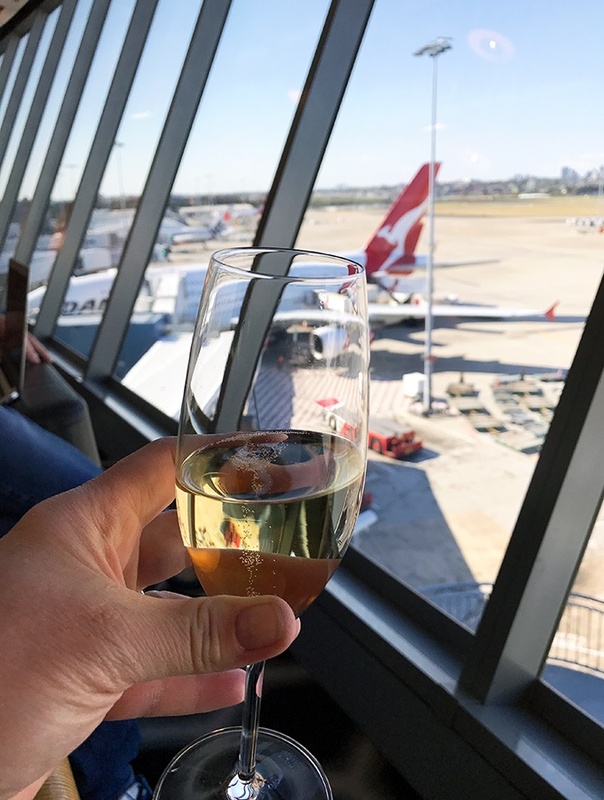 If you could spend a couple of hours in Qantas first class loung Sydney what would you do? Would it be a case of hitting the spa or indulging in a Neil Perry designed meal? Or would you do the lot? Location: Airside Level 4, past immigration and duty free, head up the escalator, enter on level 3. Lounge Facilities: Dining, Bar Service, Barista, Tea/Coffee & Beverages, Spa, Showers & Toilets, Free Wireless Internet, Internet Access, Apple Computers, Meeting Rooms, Private Suites, Library, Newspapers and Magazines. 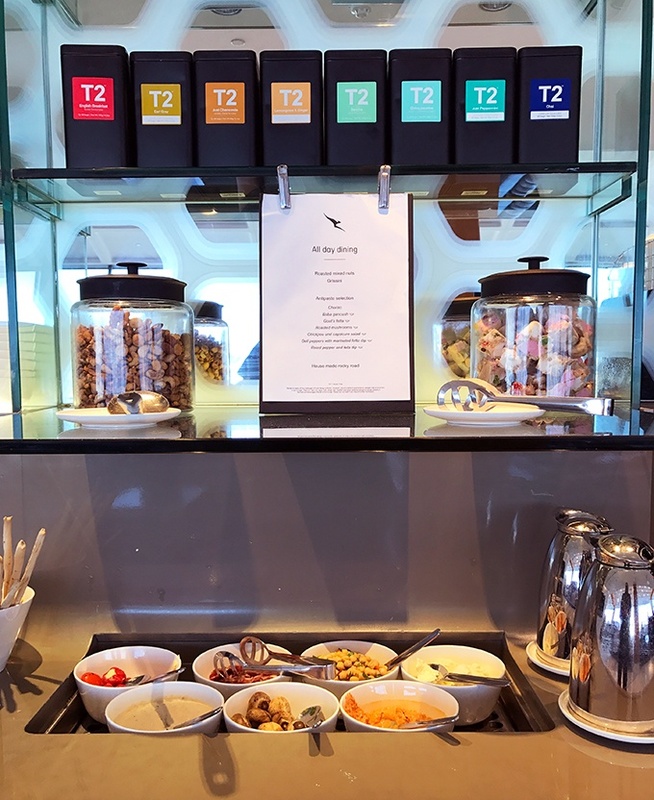 Qantas Club Annual Guest Cards is accepted. Don’t blame me if I manage to miss my flight here. It is one amazing lounge. With so much luxury and such yummy food. Love the shots you have taken of those. Makes my tummy rumble. The food looks epic. 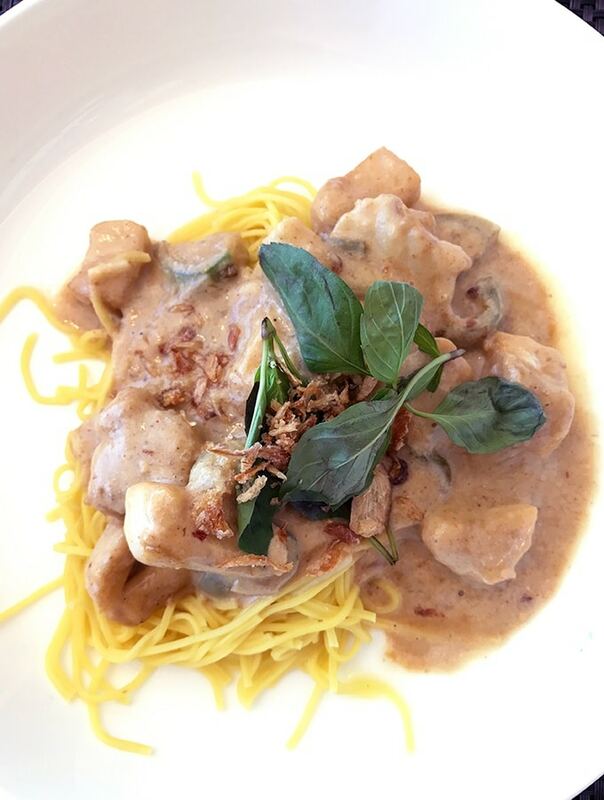 It looks like food from a 5 star restaurant. The lounge chairs look really comfy as well. Isn’t it lovely to spend your layover time in such a first class lounge? I had the opportunity to spend some time in one or two of these first class lunges. They are all pretty similar, but Quantas lounge in Sydney seems more modern. 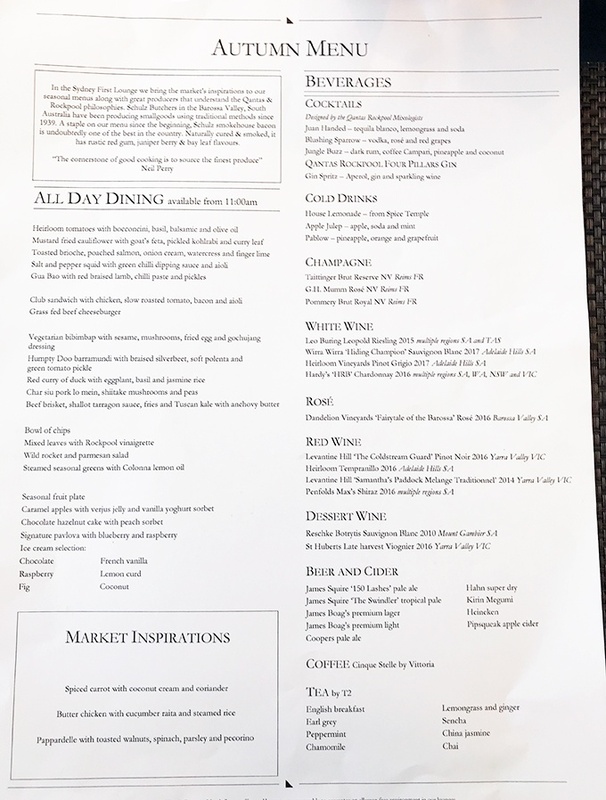 It also as a very impressive food menu. What I like about these lounges is the fact that you can lie flat and even take a shower. Looks very modern, but oh wow! You did order a lot of food! 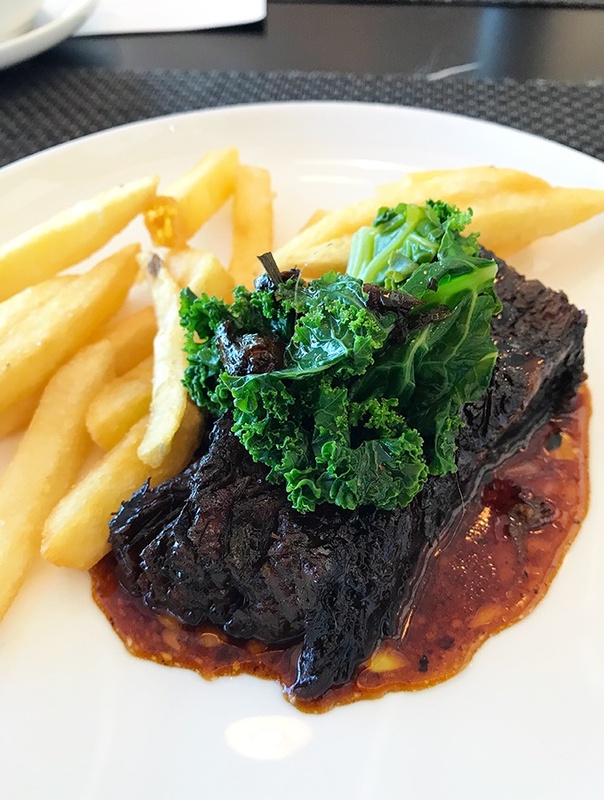 The slow cooked beef rib looks delicious! 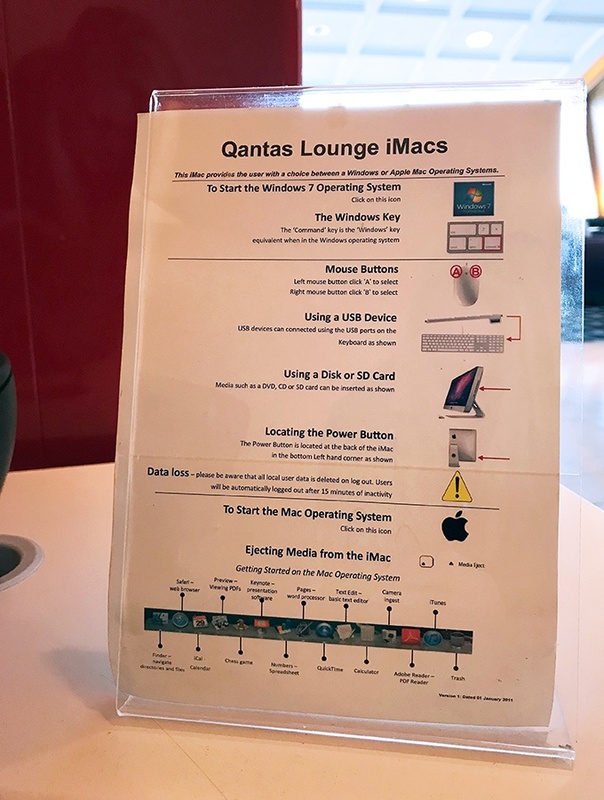 The business center in the Qantas first class lounge Sydney is so impressive, particularly the fact that there are iMacs for guests. 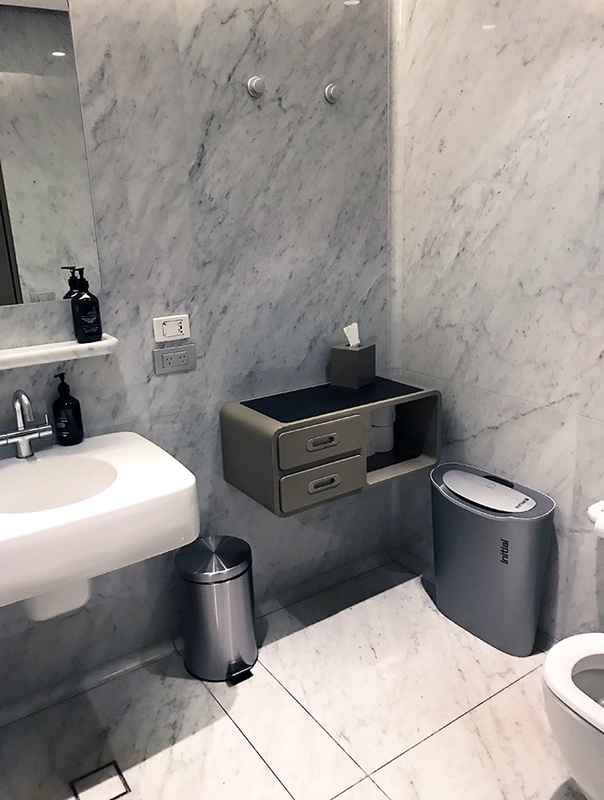 Really impressed the way the bathroom has been done up. I often rate living options based on that. I have never been in a first class lounge, ever. Your description and images have me drooling. I think if I had the privilege of going once I would be hooked and upset if I didn’t have ongoing access! It certainly is a great lounge. Also, the virgin lounge in Sydney ranks high as well.